10 kΩ R-V10KL-M-16 Body Depth 0.36 in. 10 kΩ R-V10KL-M-16 Body Diameter 0.65 in. 10 kΩ R-V10KL-M-16 Bushing Length 0.25 in. 10 kΩ R-V10KL-M-16 Metric Thread Major Diameter 7 mm. 10 kΩ R-V10KL-M-16 Metric Thread Pitch 0.75 mm. 10 kΩ R-V10KL-M-16 Packaging Dimensions 1.3 in. x 1 in. x 0.8 in. 10 kΩ R-V10KL-M-16 Shaft Diameter 0.235 in. 10 kΩ R-V10KL-M-16 Shaft Length 0.53 in. 10 kΩ R-V10KL-M-16 Shaft Rotation 300 deg. 10 kΩ R-V10KL-M-16 Weight 0.013 lbs. 100 kΩ R-V100KL-M-16 Body Depth 0.36 in. 100 kΩ R-V100KL-M-16 Body Diameter 0.65 in. 100 kΩ R-V100KL-M-16 Bushing Length 0.25 in. 100 kΩ R-V100KL-M-16 Metric Thread Major Diameter 7 mm. 100 kΩ R-V100KL-M-16 Metric Thread Pitch 0.75 mm. 100 kΩ R-V100KL-M-16 Packaging Dimensions 1.3 in. x 1 in. x 0.8 in. 100 kΩ R-V100KL-M-16 Shaft Diameter 0.233 in. 100 kΩ R-V100KL-M-16 Shaft Length 0.53 in. 100 kΩ R-V100KL-M-16 Shaft Rotation 300 deg. 100 kΩ R-V100KL-M-16 Weight 0.018 lbs. 22 kΩ R-V22KL-M-16 Body Depth 0.37 in. 22 kΩ R-V22KL-M-16 Body Diameter 0.65 in. 22 kΩ R-V22KL-M-16 Bushing Length 0.25 in. 22 kΩ R-V22KL-M-16 Metric Thread Major Diameter 7 mm. 22 kΩ R-V22KL-M-16 Metric Thread Pitch 0.75 mm. 22 kΩ R-V22KL-M-16 Packaging Dimensions 1.3 in. x 1 in. x 0.8 in. 22 kΩ R-V22KL-M-16 Shaft Diameter 0.25 in. 22 kΩ R-V22KL-M-16 Shaft Length 0.54 in. 22 kΩ R-V22KL-M-16 Shaft Rotation 300 deg. 22 kΩ R-V22KL-M-16 Weight 0.013 lbs. 220 kΩ R-V220KL-M-16 Body Depth 0.37 in. 220 kΩ R-V220KL-M-16 Body Diameter 0.65 in. 220 kΩ R-V220KL-M-16 Bushing Length 0.25 in. 220 kΩ R-V220KL-M-16 Expanded Diameter 0.65 in. 220 kΩ R-V220KL-M-16 Metric Thread Major Diameter 7 mm. 220 kΩ R-V220KL-M-16 Metric Thread Pitch 0.75 mm. 220 kΩ R-V220KL-M-16 Packaging Dimensions 1.3 in. x 1 in. x 0.8 in. 220 kΩ R-V220KL-M-16 Shaft Diameter 0.235 in. 220 kΩ R-V220KL-M-16 Shaft Length 0.54 in. 220 kΩ R-V220KL-M-16 Shaft Rotation 300 deg. 220 kΩ R-V220KL-M-16 Weight 0.013 lbs. 4.7 kΩ R-V4D7KL-M-16 Body Depth 0.37 in. 4.7 kΩ R-V4D7KL-M-16 Body Diameter 0.65 in. 4.7 kΩ R-V4D7KL-M-16 Bushing Length 0.26 in. 4.7 kΩ R-V4D7KL-M-16 Metric Thread Major Diameter 7 mm. 4.7 kΩ R-V4D7KL-M-16 Metric Thread Pitch 0.75 mm. 4.7 kΩ R-V4D7KL-M-16 Packaging Dimensions 1.3 in. x 1 in. x 0.8 in. 4.7 kΩ R-V4D7KL-M-16 Shaft Diameter 0.235 in. 4.7 kΩ R-V4D7KL-M-16 Shaft Length 0.53 in. 4.7 kΩ R-V4D7KL-M-16 Shaft Rotation 300 deg. 4.7 kΩ R-V4D7KL-M-16 Weight 0.015 lbs. 50 kΩ R-V50KL-M-16 Packaging Dimensions 1.1 in. x 1 in. x 0.8 in. 50 kΩ R-V50KL-M-16 Weight 0.013 lbs. 1 answers Will this work as the gain pot on a JCM900? We are unsure if this will work in your amp. If you pull the pot out of your amp, you should see some lettering at the top of the pot. It should either start with the letter B or A. B is a lineal pot and A is an audio taper pot. The next number will tell you the resistance such as 1M (1Meg), 10K (10 kiloohms), etc. With these characters you will be able to determine exactly what is in your JCM 900. 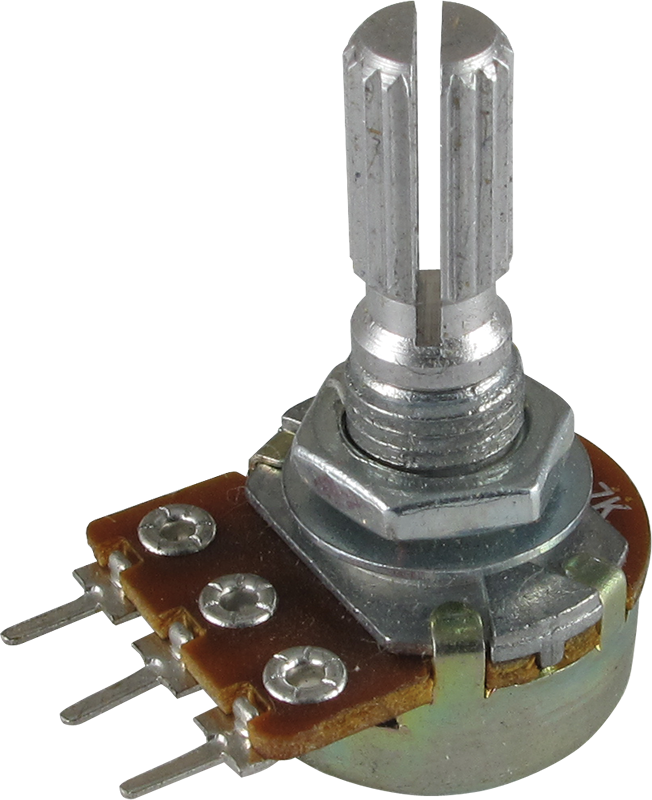 1 answers Does your 50k potentiometer R-V50KL-M-16 have the damped rotation that makes it harder to turn, or does it turn freely? This pot has some tension when you turn it. 1 answers Will this pot fit a Yamaha HY-10G Guitar Amp for the Volume pot? The best thing to do is remove the volume pot and do a visual comparison with this pot. We can also compare specs if you need measurements. I used these pots in an Ashdown bass amp. The shafts were a few millimeters too long, but I was able to cut the shafts to the proper length with a Dremel tool. The pots are advertised as Marshall parts but I've used them in all different brands. Good product!